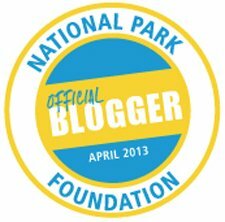 The Army in Yosemite dates back to October 1, 1890 when Yosemite National Park was established. 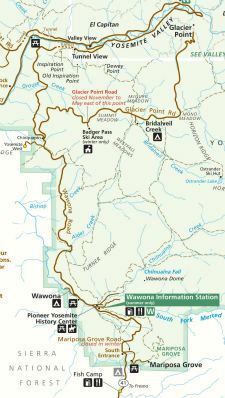 The Secretary of the Interior asked that Army troops be made available, (as they had been in Yel­lowstone), and begin patrols protecting the park. Cavalry scouting parties were to be sent out to "prevent timber cutting, sheep herding, trespassing or spoliation in particular." On April 6, 1891 Troop I of the Fourth Cavalry, sta­tioned at the Presidio in San Francisco, was chosen for this duty. 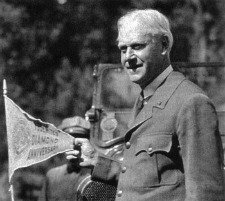 Captain Abram Epperson Wood was placed in command, and at the same time was designated the Acting Superintendent of the park. 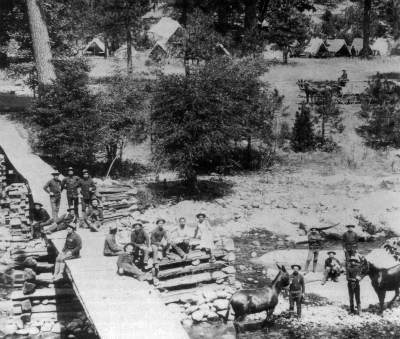 On May 19, the Fourth Cavalry completed the 250 mile trip, and a camp was established in the area between the South Fork of the Merced River and the Wawona Road, one mile north of the community of Wawona. The arrival of the army in Yosemite and their enforcement of the new restrictions on grazing was regarded by the sheepherders and ranchers in the area as unwelcome govern­ment intervention, and they defiantly continued to bring in their animals. To complicate things for the newly arrived troopers, the maps that they brought from San Francisco were incomplete and inaccurate. Most of the land that fell within their authority didn’t have roads or trails. The laws enforcing the new useage of the park carried no penalties for trespassing other than the removal of the offenders from the area…Captain Wood was forced to invent his own methods. 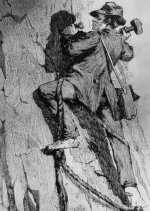 Wood was a smart and creative military officer who became a mountain man out of necessity. He took his new assignment seriously and tackled his duties with a sense of fairness. He gathered what information that he could from the maps that he had, and dispatched new patrols to scout and assess their situation. In a surprisingly short time he had a much better grasp of what they faced. It seemed to Captain Wood that the larger cattle own­ers did their best to comply by keeping their livestock out of restricted areas. But many of smaller operators were too poor to hire herders. Their stock would often naturally drift up the canyons into the higher mountains as the grasses in the foothills became sparse. The sheep were a much more serious problem for Wood not only because of their numbers, but because of the stripped conditions they left in the areas that they had grazed. In the late Spring of each year more than 50,000 sheep would begin to move up from the depleted grasslands of the foothills to the new grazing areas of the Sierra near the southern and western boundaries of the park. The sheep herds were normally 2,000 to 3,000 in number, and were accompanied by three or four herders and their dogs and pack animals. With no laws against trespassing in place for enforcement, the creative Cavalry officers devised their own methods, using a strategy which had been proven effective by the earlier Yellowstone superintendents. As they discovered grazing in restricted areas, the troopers would separate the animals from the herders. They would accompany the trespassers out through one end of the park while the animals were driven out from the opposite side. In the four to five days that it took for the herders to rejoin their flocks, their sheep had often died from the elements or were scattered. When a man lost his herd in this manner he didn’t often return. 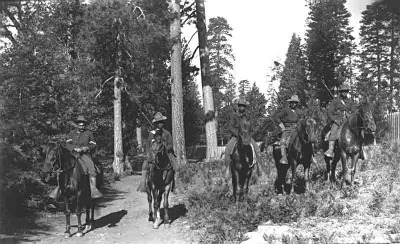 The patrolling of Yosemite was a rare instance where mounted army infantrymen were employed as well as regular cavalry troopers due to the sheer size of the area that needed to be administered. 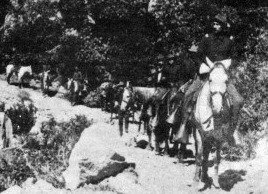 Pictured here are "Buffalo Soldiers" of the 24th Infantry on horseback. Captain Wood died in early 1894 and command of the park was passed on to Captain G. H. G. Gale and Troop C of the Fourth Cavalry. 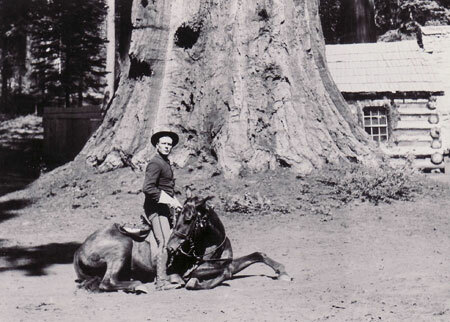 Captain Gale made it one of his first priorities to request that their camp name be changed from Camp Wawona to Camp A.E Wood in honor of Captain Wood. Permission was granted. Captain Gale quickly recognized the need to continue the mapping efforts begun by Captain Wood, and that same year surveying duties were assigned to Lieutenant N. L. McClure. On this assignment, McClure became the first to explore and map the areas north of the Tuolume Rivers, and he is also recognized as being the first white American to view the Hetch Hetchy Valley. 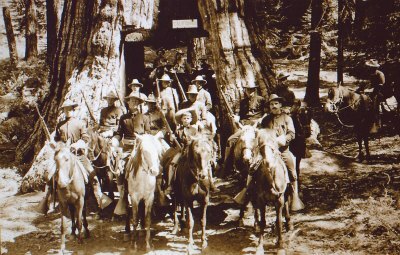 Army operations were based from Camp A.E Wood in Wawona for the next 12 years. 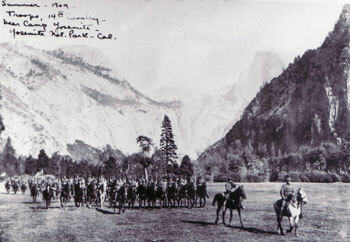 However, with Yosemite Valley central to military activities within the park, the valley had always been the logical place to establish Park Headquarters. 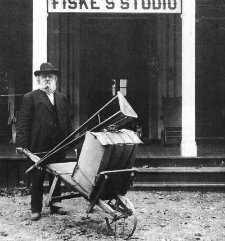 In June of 1906 Secretary of the Interior Ethan A. Hitchcock directed newly promoted Major Harry C. Benson to move Camp A.E. Wood from its location in Wawona to the valley, and this was accomplished several months later in August. To return to the Homepage from the Army In Yosemite click here. The History of Photography in Yosemite.